This movie may be old (released in 1994) and have a million reviews. But, it's worth blogging and talking about. This easily goes to my list of favorite movies of all time. Oh wait. It probably is my FAVORITE movie of all time. It's the best movie I've seen to date. 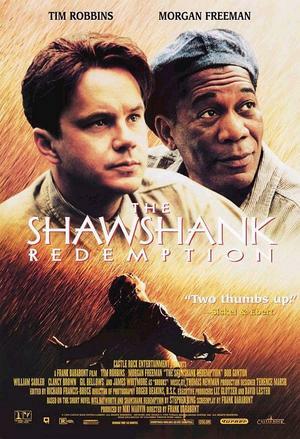 The Shawshank Redemption tells the story of a convicted man going through the rough system of a marine state prison (Shawshank). In the process, he changes the lives of the people around him and leaves a valuable lesson on hope, friendship and freedom. Rarely does a movie hit me on a personal level. But, this movie totally did. It gave me that feeling of eternal hope, freedom and friendship that no movie has ever done yet. Profanity aside (in most of the script), watching The Shawshank Redemption gave me that 'cleansing' experience. That feeling where you get refreshed, renewed and have a new perspective in life. It may sound a bit exaggerated. But, yes. That was the best 2 hour movie experience I ever had. This is one of the best stories ever written. Stephen King is an awesome writer. Tim Robbins and Morgan Freeman were exceptional in this movie. The movie is unforgettable. I could watch this over and over just to get that renewed feeling of being hopeful in life. It must be true then. Hope is really a good thing ... and no good thing ever dies. This movie talks about eternal hope, it sticks on you and for that reason this movie will never die.